For those of you that have followed my FM saves for the last few years you’ll know that, contrary to DGear’s belief, I tend not to manage teams like Newcastle. Instead I look further afield to try and finding something different that’ll capture my attention. From Panathinaikos in Greece to Deportivo Cali in Colombia, Caracas in Venezuela to the mighty Al Wahda in the UAE and mostly recently, in FM18, a fantastic save in Libya that saw Al Ahli lift the Club World Cup in spectacular circumstances. 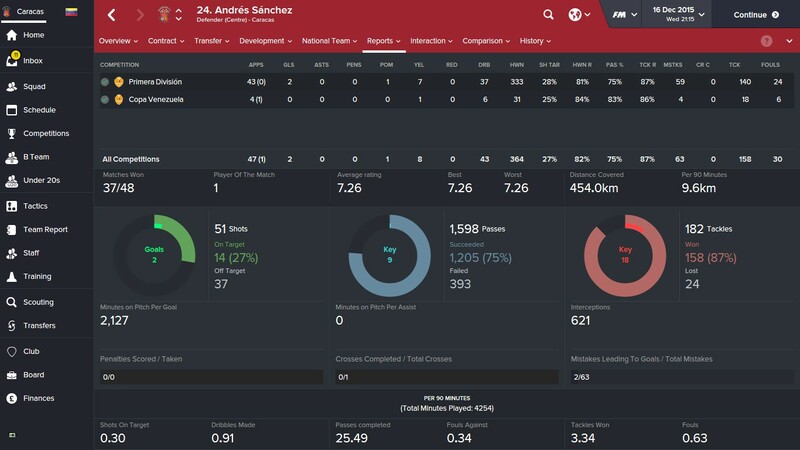 Now there is also a common theme with all of these saves, I not only manage a club but I also manage the country as well. I’ve maybe not quite had the same success with the national sides as I have with the club sides, my only success being a 2018 World Cup win with Greece back on FM14. Granted it’s probably easier to win a World Cup with Greece than it is with Venezuela, UAE or Libya. My approach to C&C has always differed to Shrew’s as the club has often come first with me looking to build the backbone of the national side at the club I’m managing. This has led me to hold on to talented youngsters and lock them in the basement rather than let them move on to the bigger leagues around the world. The rational has always been that a team is stronger than an individual and that a team of less capable players that have spent their entire careers playing together, is stronger as a unit than 11 individuals playing with different players and styles for their clubs. Whilst this probably worked for Venezuela and the UAE, it did not for Libya in a continent full of internationals playing outside of their home nation. This makes me think that my Country of choice for FM19 will have to have a bit more of a blend between the Mendoza ‘Keep them at all costs’ method and the Shrewnaldo ‘Sell Sell Sell’ method. 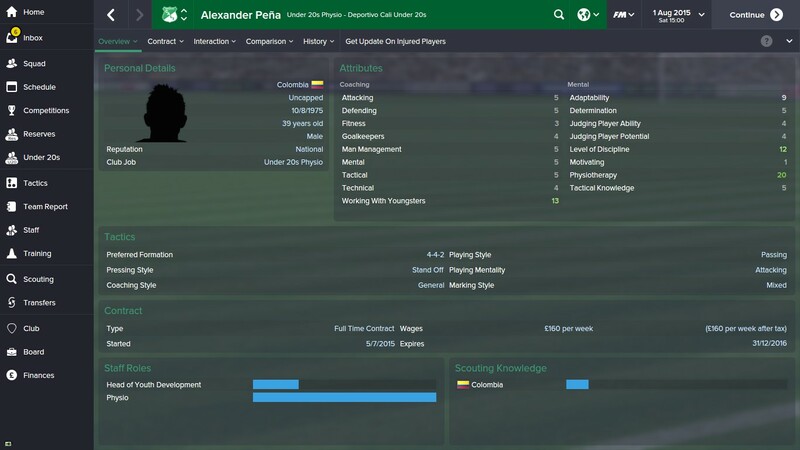 Another area of my C&C approach that I will continue to do is to blend domestic players with South American talent both young and old. With Diego Mendoza being South American it seems only right that he should surround himself with South American players and coaches and this is something I will not change as I feel it has served me well in previous jobs. This is where I get excited about one of FM19’s new features, the new training module. It should make things very interesting and I’m hoping that I can use some of the veteran South Americans that I’m so fond of, to have more of an influence in the style of national player coming through using the mentoring group system. So with all this talk about how the save is going to go we should probably get to the most important question, where am I going? As most of you know I’m not one for the conventional places to manage and I rarely play in an ‘Out of the Box League’ these days. So after much deliberation I’ve settled on coming back to Europe…but only just. Kazakhstan borders China and geographically is situated in Central Asia, however they joined UEFA back in 2002 and as such it will give me a chance to compete in European competitions for the first time since FM15. I think one of the reasons I quite fancied a return to European football was the start of the new UEFA Nations League and how that could be quite interesting to compete in. So, what do you need to know about Kazakhstani football? 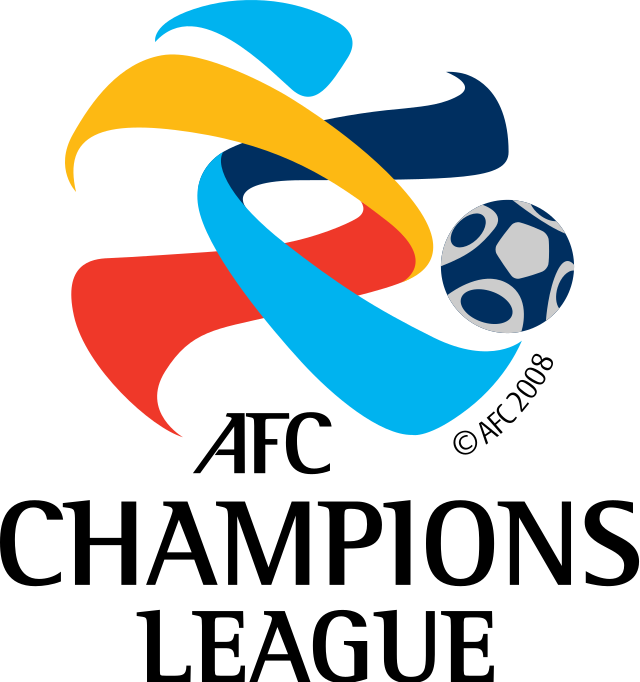 Well after the break up of the Soviet Union it formed its own league in 1992 and the National side joined the AFC however after failing to qualify for the 1998 and 2002 World Cup they made the decision to join UEFA. The National team currently sits 118th in the World, 19 places below my previous employers Libya. I’m hoping though that with the new Nations League to compete in and myself at the helm that I can quickly rise up the rankings. What gives me faith is the steps the domestic league has been making in recent years. The rise in Kazakhstani football has been driven primarily by state funded Astana who made the group stages of the Champions League in 2015 and then managed to finish 2nd in their Europa League group last year before going out to Sporting Lisbon in the last 32. Unfortunately, the other big sides in the league have been unable to repeat the same feat as of yet but that’s hopefully where Diego Mendoza’s arrival will start to change things. When I was looking at clubs to manage I thought about going with one of the big ones like Kairat or Aktobe, the main rivals to Astana. However, the more research I did I eventually settled on a club from Kostanay in the North of Kazakhstan, FC Tobol. Why FC Tobol I hear you ask? A club located 3,339.9 miles away from my sofa and probably one that not many people will have ever heard of. Well for starters they have the only Argentine playing in Kazakhstan, Juan Lescano formerly of Liverpool, who is on loan from Anzhi. They also have a kit that I really like which as some of you may know by now I do base a lot of my club choices on the kit they wear. There is however a lot more to FC Tobol which I hope is going to make this save as enjoyable as previous years. Founded in 1967 as Avtomobilist they’ve changed their name several times over the years and despite joining the newly formed Kazakhstan Premier League in 1992 as Khimik, they settled on their current name, FC Tobol in 1995. The name Tobol comes from the river that runs through Kostanay if any of you are interested. 😊 Sadly, it’s hard to find any other interesting facts given that my Kazakh and Russian isn’t the greatest. They play their home matches at the Central Stadium in Kostanay with it holding a maximum capacity of 10,000 fans. Now this is quite a contrast to the 80,000 I could host when managing Al Ahli (LBY) and I’m sure this is going to have an impact on the revenue I receive from home matches. In terms of historical success, it took until 2002 for FC Tobol to establish themselves as a challenger in the league, with them finishing no lower than fourth between 2002 and 2010. A cup win in 2007 was their first silverware before eventually winning the league in 2010. Unfortunately for the team since then things haven’t quite gone to plan as the club has slid back to mid-table mediocrity, finishing outside the top 4 ever since. It would appear I’m tasked with bringing a former title challenger back into the limelight once more. Just the way I like it. Of that title winning side from 2010 only 2 players remain at the club, winger Azat Nurgaliyev and veteran striker Nurbol Zhumaskaliyev. Now 32 and 37 respectively these two would normally be at the end of their careers but as many of you know I love a veteran and as such both will be part of my football revolution in Northern Kazakhstan. The current squad also contains several Kazakhstani internationals; goalkeeper Nepohodov, defenders Miroschnichenko and Dmitrenko, young and exciting attacking midfielder Maxim Fedin and striker Bauryzhan Turysbek. 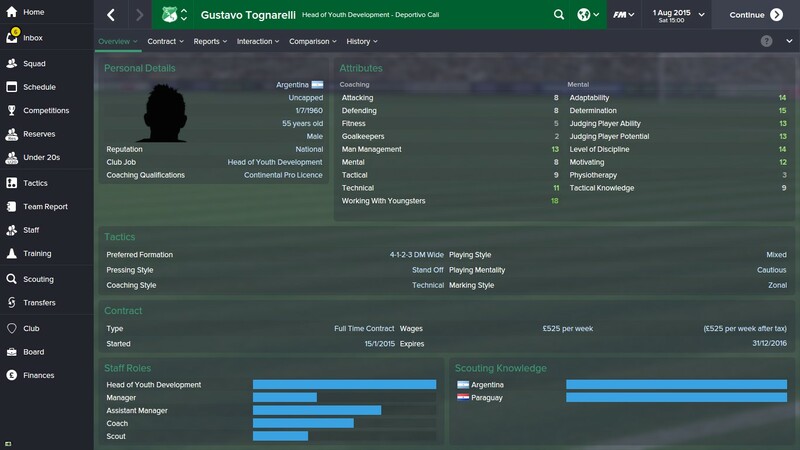 It also contains Georgian international midfielders Kankava and Kvekveskiri, Lithuanian Destroyer Zulpa and Central African defender Kassai. It would be fair to say I’ll be inheriting a half decent squad that contains plenty of experience which will be key to developing the next generation of players to take Kazakhstan to the next level. Now as many of you know by now, I love South American players and in all my saves whereever I might be managing I always try and bring the flair, passion and entertainment synonymous with South American football and footballers. How I have managed that in the past is through blending a mixture of Youth and Veterans from the continent into my Youth teams with the hope that over the long term the style will rub off on the local lads. In the past this has always been a theoretical approach with the only real way to try and implement this being by either tutoring or in more recent times squad dynamics. I’d always shove a couple of veterans into the reserve squad with the idea being that if I was playing on a pitch week in, week out with a seasoned pro I’d learn a lot more than I would just playing with a bunch of kids. Whether this made any difference in previous FMs is dubious. 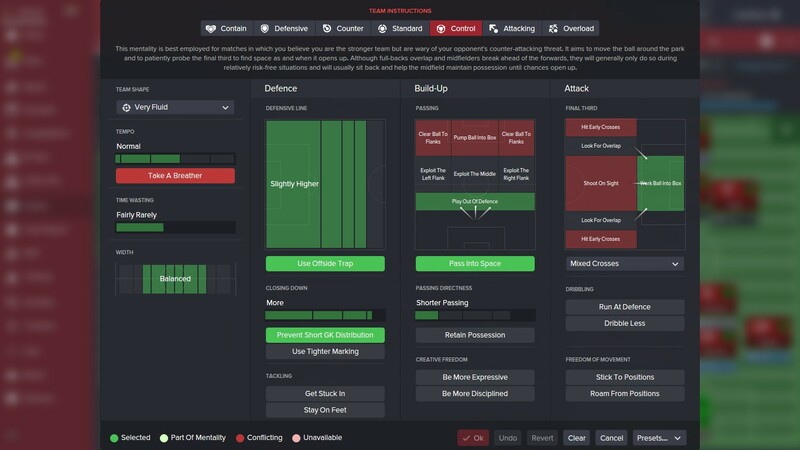 With FM19 this is hopefully going to change, and the new training and mentoring module will give me the opportunity to apply a bit more of my theory. I hope that a combination of by grouping players with the right sort of mentors in the youth teams, specific training sessions focused on South American-esque skills and blending mentally strong players alongside weaker local players will all lead to the ultimate goal, development of Kazakhstani football. It’s always good to have a plan that isn’t just win everything as let’s be honest with the speed I play at Kazakhstan aren’t going to be winning the World Cup on FM19 and Tobol won’t be winning the Champions League. That doesn’t mean however there isn’t a lot that I can’t achieve and to be honest I’m quite excited about the prospect of a save where the plan isn’t to conquer the world as I did with Al Ahli (LBY). I’ve split my plan between Kazakhstan and FC Tobol and I think it’ll be interesting to revisit these at the end of FM19 to see how I got on. Love every minute of hopefully another roller coaster of a year. Another part of my saves that I’ve loved over the last few years is following the team and country I’ve managed in real life and this year is no different. On initial research it was a difficult league to track down however I was not to be deterred and eventually with the help of google translate and some creative googling I’ve come across two useful little resources for Kazakhstani football. An English language blog covering the Kazakhstan Premier League providing short and sweet analysis of each of the matches taking place on a weekly basis. The Kazakhstan Football youtube channel where you can live stream and watch back full Kazakhstan Premier League matches. I cannot wait for the next Mummy Squad wine night when I can be sat in bed playing FM and watch Tobol play in real life. With ‘onwards’ being my 1999th word, I thought it only right that I push this blog post over the 2000 word mark and deliver on my promise to deliver my blog post for 2018. 😊 I will continue to keep everyone updated on my save primarily via Twitter, live tweeting when alone or just the odd summary tweet when Mrs M is marshaling the FM playing arena. I’m going to try and get back to being a bit more active on my Slack channel again (Find me at #diegomendozatv), primarily in the hope that @FMPressure will come back. I think sadly there is more chance of me winning the Champions League with FC Tobol than that happening. I will however try and share more matches, screenshots etc. on there until Sheriff Samo rocks up to delete everything. I hope that you’ve enjoyed my blog post and that you’ll enjoy following the ups and mostly downs of managing in Kazakhstan. What have I let myself in for. In this article I want to provide a very brief history and background of the Deportivo Cali academy, highlighting some of its famous graduates. 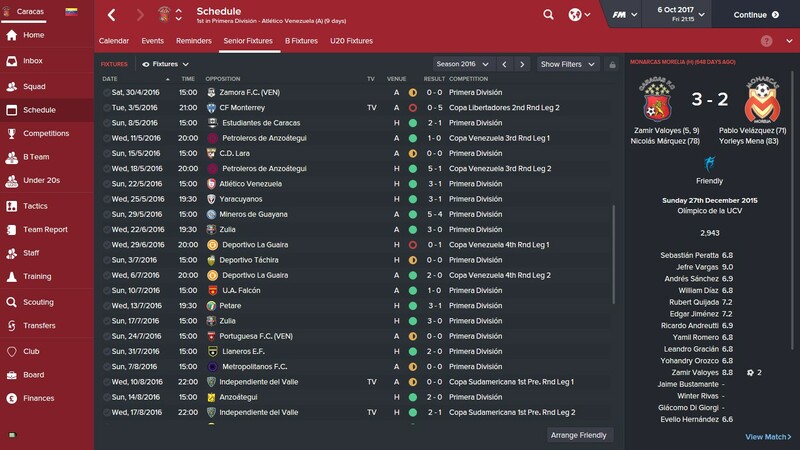 I will then take a look at my base philosophy, my current in game setup, my staff and my two academy teams. What this article won’t tell you is a definitive way to create an amazing youth setup where every youngster reaches their maximum potential. There are plenty of articles for that and some have been used to influence my approach to youth development over the years. I will include links to those so that if people want to conduct further reading they can. Hopefully what this article will do is give you an insight into my thinking behind the Academy in Cali and what eventually i hope to achieve through this approach. I’ve been trying to find more information about the youth setup in Cali but given my Spanish doesn’t extend far beyond ordering two beers, I have been struggling. What I do know is that the Deportivo Cali academy has produced a number of decent Colombian footballers over the past 20 years. Now I accept the casual fan may not have heard of a lot of those players but for someone who has been playing CM/FM a long time I’ve come across most of those on the list. It seems only fair that I should try and do the academy justice in my current save with Deportivo Cali especially given some of the gems that have already emerged from the youth intakes I’ve had so far. 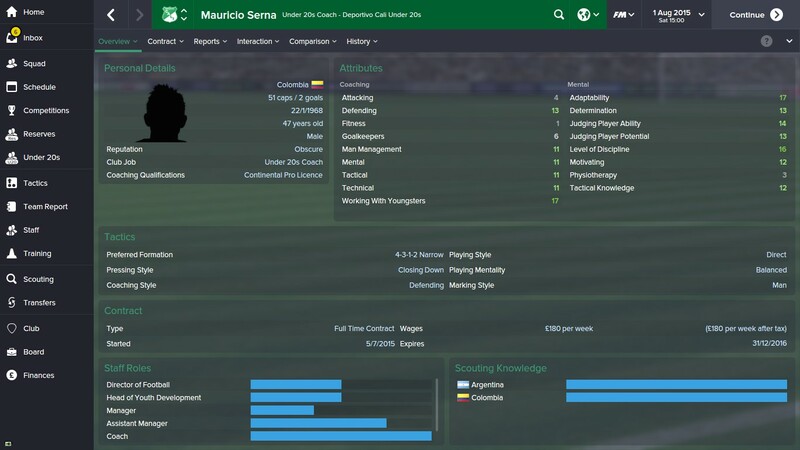 The classic South American academy model is to produce exports to the European leagues. Players are often trained to maximise individual ability and sales price rather than to fit into a specific club model as they are in most of the top European academies. The Argentine clubs in particular are renowned for their ability to generate the same type of player out of their academies. This then leads them to be able to market their academy players a being the next so and so and extract a significant amount of income from European clubs. How many Argentine players have been dubbed the next best thing and never made it? Colombia on the other hand still exports a number of players yet for seemingly far less of a financial gain and as such the league struggles financially. The likes of Juan Cuadrado, Falcao, Jackson Martinez, Freddy Guarin and Eder Balanta have all moved to clubs outside of Colombia when they were young and the majority of them were bought by 3rd parties. 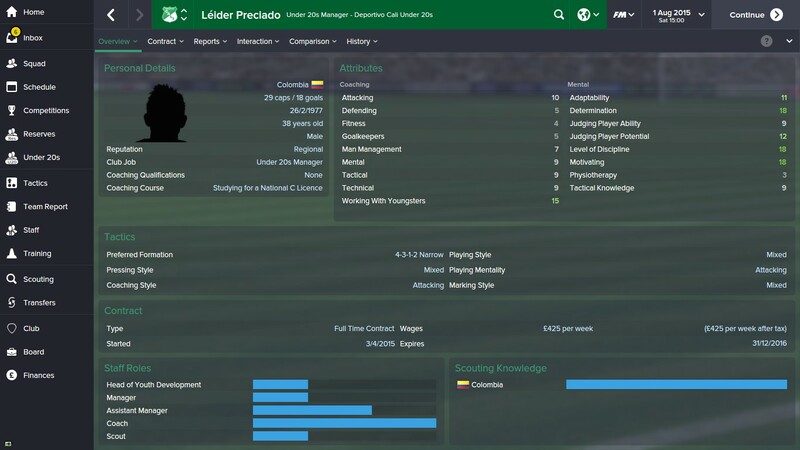 Colombia produces talent but the league itself doesn’t benefit financially. With Deportivo Cali I’m taking a slightly different approach and rather than looking to export at a young age I will be looking to build a team around academy players. I want those academy players to come through playing the 4-2-3-1 high press, high tempo, short passing, attacking game that the first team play. 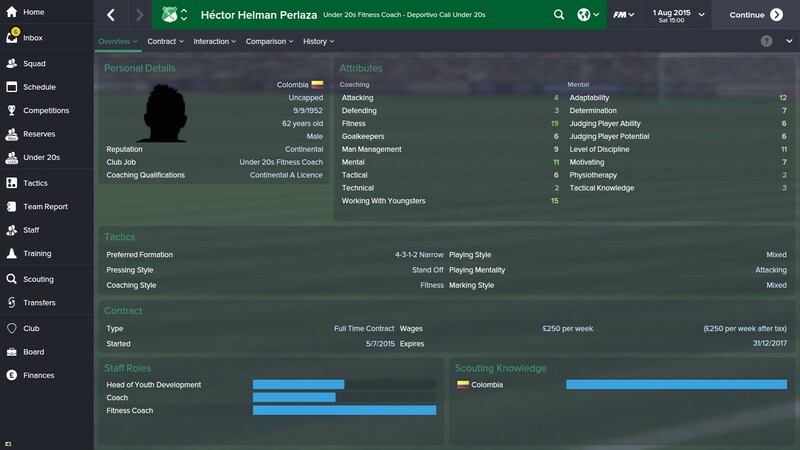 I want my Deportivo Cali to be the fittest team in South America and as such my academy players must be the same. They also need to be comfortable with the ball at the feet and be intelligent both with and without it. In order to promote this philosophy I have to have Academy staff that are both technical able but also are on the same page philosophy wise to make this happen. Currently I’m a club that is growing in stature so don’t have the luxury to pick and choose so the focus is on the most qualified staff attribute wise. Annoyingly it would seem that most of my current U20 staff like to stand off rather than press but in the long term I need to make sure that the majority like to attack and press. 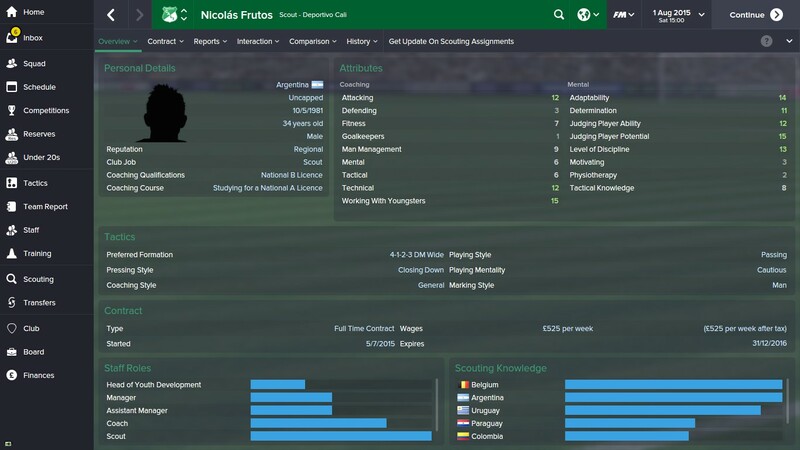 This should also hopefully influence the type of player arriving in the youth intake each year. Let’s then meet the staff. There are two squads, Deportivo Cali B which will be the First Team of the Academy and Deportivo Cali U20 which will be Second Team. Each squad must be made up of a maximum of 23 players, this is to ensure that players are exposed to maximum amount of game time and ensure optimum development. This must contain 2 goalkeepers, 4 wingbacks, 4 central defenders, 2 holding midfielders, 2 roaming playmakers, 2 enganches, 4 shadow strikers, 3 advanced forwards. 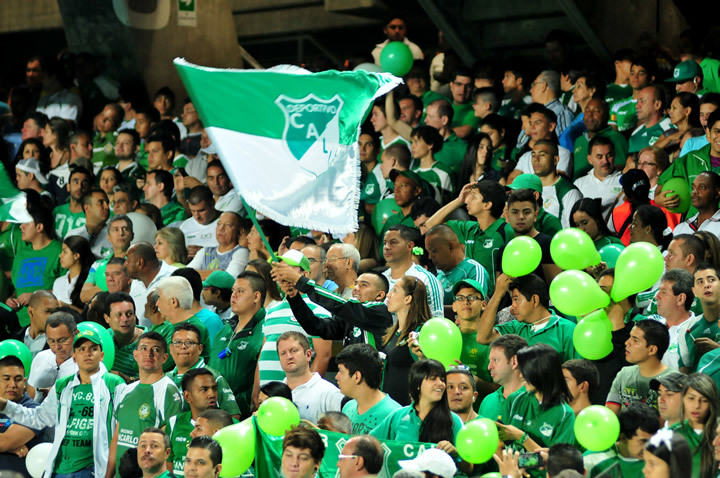 Any players deemed by the academy staff not good enough for the first team or that don’t fit with the Deportivo Cali philosophy should be released before their 18th birthday to ensure proper development elsewhere. All teams must play the same tactics as the first team but freedom is given to the two managers to adjust in match situations. This team should primarily be focused on high Fitness, Attacking, Tactical and Ball Control with a 3 month rotation being in place between the three. Match preparation should be set to teamwork and individual training should be set to light. Position retraining should happen during a players time in the under 18 squad. Individual routines – Should be defaulted by position unless a specific attribute needs drastically improving. All Central defenders must be set to Central Defender – All duties. All Full backs must be set to Fullback – All duties. The expectation will be that where possible each player will have at least 6 months tutoring from a member of the first team squad before graduating from the first team. Affiliated clubs Depor FC and Boca Juniors (COL) will be used to send those players between the age of 19 and 21 that are outside of the squad of 23. They will be given one year on loan to impress before either being released or given a place in the first team squad. Loans will be considered for academy players where they are guaranteed first team football at a top division club. A recall option will be include to safe guard against a player not getting the game time required. The Academy will also look to loan Colombian Youth internationals currently playing in foreign academies if management deem this will strengthen the team. Ideally this will lead to a permanent transfer if the player impresses and acquiring him is within the clubs means. 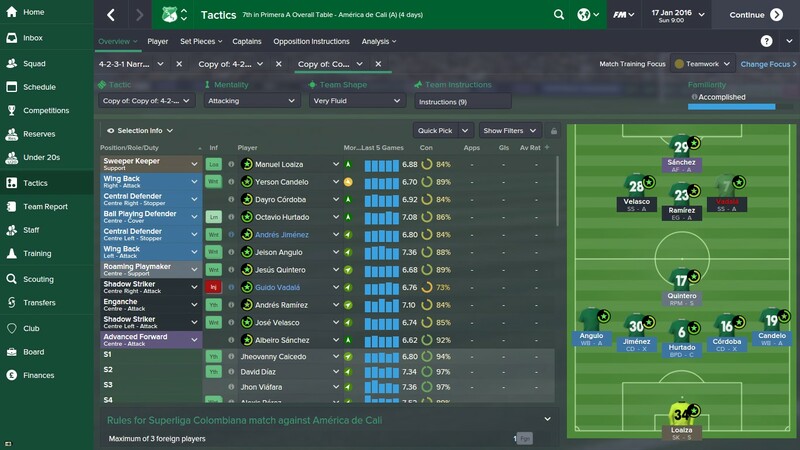 Starting in 2016 all academy sides will be playing a new 5-1-3-1 attacking formation which can be found in this thread in the Tactics section. They must continue to be familiar with the First Team 4-2-3-1 tactic to allow future tactical flexibility. The Academy First team will also play every match of the Copa Postobon to aid their development and eventual transition to the first team. The whole point of putting a lot of effort into my academy is to get something out of it and as such i need to have goals to show that I’m achieving something from my theory. The goal of the save has always been to dominate Colombia, to win the Copa Libertadores or Sudamericana and put the Colombia league on a par with the Argentine and Brazilian leagues. 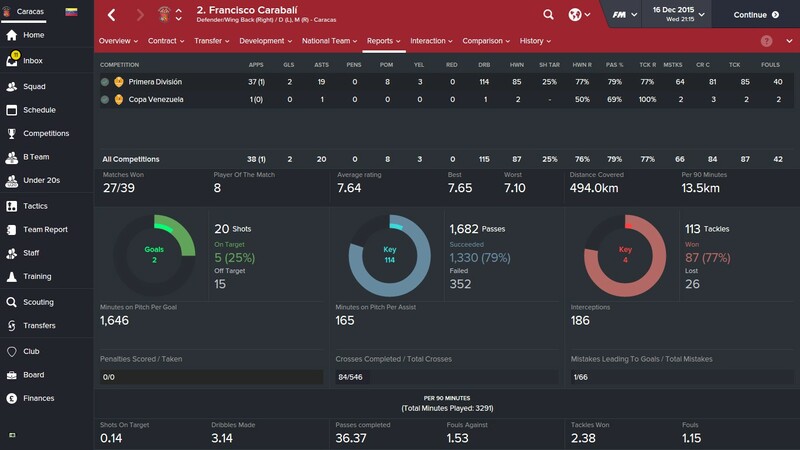 Now given the players that have come through my youth intake in the first couple of years, I have been given the opportunity of trying to winning these continental competitions with a team primarily made up of Deportivo Cali Academy graduates. I also want to classify those players who have played for the club on loan for over a season until they are 21 as academy graduates too. It is by no means an easy challenge but I think that if I stick to my philosophy, mold the staffing setup around that philosophy and continue to pay attention to all my players’ development and not just the superstars, then I hopefully can achieve that. For those of you that follow me, you’ll appreciate that it has been a very long time since I’ve written anything more than a 150 character tweet or slightly longer paragraph about my save on Slack. You will also hopefully be aware of what’s happened in the 6 years I’ve been in charge of Al-Wahda. For those of you that don’t, I’ve turned Al Wahda from a team on the fringes of Champions League football into the best team in Asia. 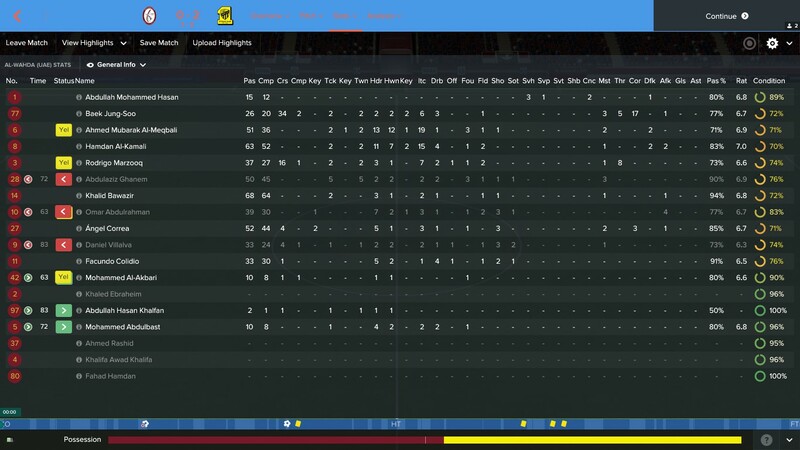 We’ve dominated the UAE Gulf League ever since we pipped Al Ahli to the Gulf League title on the final day of the season in my 1st year in charge. A surprise Champions League win against Guangzhou followed the year after and we’ve gone from strength to strength since then. We have gone on to win another 2 Champions League titles and have had 1 Final appearance in the Club World Championships where unfortunately we were taught a footballing lesson by PSG. 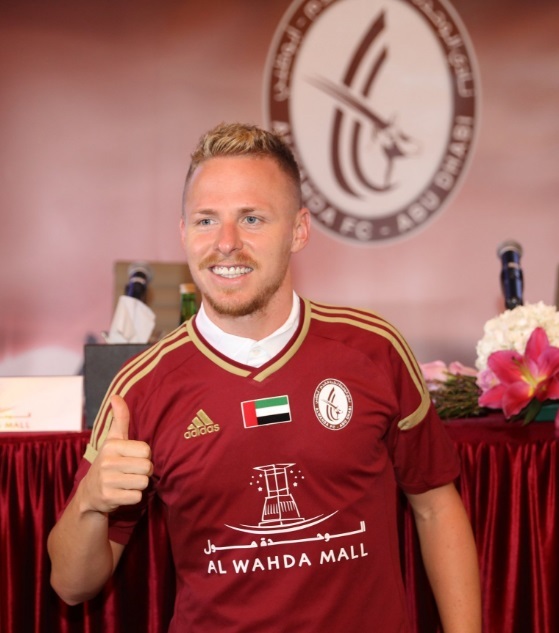 It is fair to say that in 2021 Al Wahda is starting to become a team with a global reputation and following. As such we went into this year’s Asian Champions League as defending champions and strong favourites to retain the crown. We would of course face the inevitable challenge of strong teams from China and Korea as well as an emerging force of teams from Saudi Arabia. On paper we looked a lot stronger than the Saudis and with Facundo Colidio, Angel Correa, Danny Villalva and Omar Abdulrahman there was the potential for plenty of goals in the tie. A trip to Jeddah was the 1st hurdle to overcome and despite temperatures reaching 43 degrees, a sole goal from Omar Abdulrahman gave us a vital 1-0 away win to take back to Abu Dhabi. Now normally the Al Nayhan is a fortress and I might be right in thinking that we haven’t lost at home in any competition for almost 4 years. What could possibly go wrong? Now again for those of you that follow me on twitter you’ll know that I don’t take losing games particularly well, especially important games like a Champions League Quarter final. I was furious. What had happened? We were setup perfectly from the first leg, how had we managed to throw that all away? Al Ittihad had scored their 1st goal from a long speculative effort that had come off Rodrigo Marzooq’s backside. The 2nd was again from outside the box that crept under Abdullah Hasan’s left arm when at full stretch. At the other end we’d missed several clear cut chances and Facundo Colidio had hit the bar when it was easier to score. I was fuming. My last big challenge is for Al Wahda to lift the Club World Championship and we’d gone and ballsed that up without even getting to the semi final of the Champions League. I received the inevitable yellow card from Mrs Mendoza for throwing my toys out of the pram in the living room over “just a game”. Luckily she was in the room else the poor sofa would have been seeking a new home once I was done with it. I had to walk away, cool off, get my head straight and get back to work. I put the match to one side with the promise to myself that I would go back at some point and look at what really did go wrong. Anyway here I am, a few weeks later, starting to pull apart what went wrong that night and what i can learn, if anything, from that hugely disappointing night. 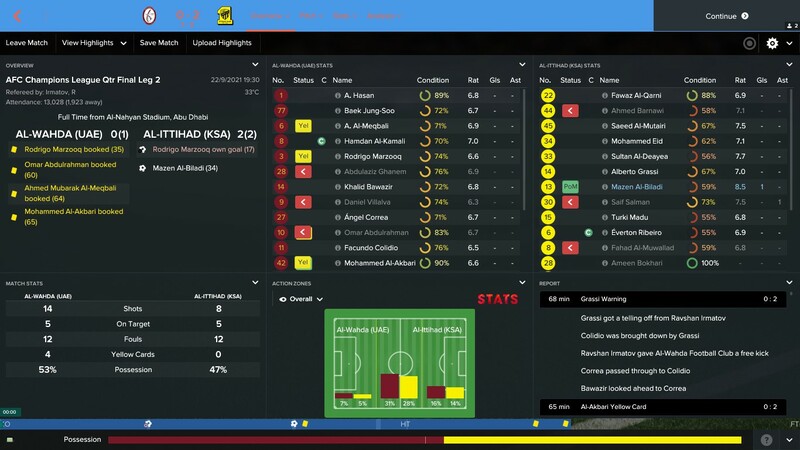 Before I get into looking at my own team I thought I should start with the Al-Ittihad goals as ultimately they were the most important reason we lost. The 1st goal had a hint of good fortune about it but I would argue that we weren’t quick enough to close Grassi down. Given our whole game is built around an aggressive pressing game, this should be our bread and butter. The second goal is more of the same and what is really disappointing is the fact that a lot of our issues are caused by several stupid mistakes. For starters it is obvious which player is going to receive the ball from the throw in yet for no reason whatsoever Ghanem runs away from him at the last minute. He then makes amends by initially winning the ball back but is a bit soft and just gives it straight back. There are certain players sitting far too deep and actually making no attempt to move whatsoever. We started too deep despite having a high line on our tactics and were too slow closing Al Ittihad down. I can’t help but feel that our defenders were overly complacent in their approach and their lack of aggression hasn’t helped either. We were playing at a normal tempo at the time but maybe in pressure matches like this in future I should look to up the tempo a bit more at the start of the game. We didn’t put the opposition under enough pressure early on and paid the price. That can’t happen again. Both passages of play leading up to the goal came from set pieces and I think potentially the defensive positioning setup on set pieces, especially throw ins could be looked at. Saying that normally we rarely concede from set pieces so that makes me think that there aren’t any drastic changes required necessarily, just to ensure that any opportunity for the opposition to have room to shoot from outside the box is eradicated. Annoyingly there weren’t really another goal scoring opportunities to analyse, was just typical the two they had they scored from. These things do happen in football and despite being 2-0 down after 34 minutes we still had the attacking prowess to turn games like these around. We didn’t though. Looking at stats alone we should have won that game. Obviously stats alone don’t win games but ultimately we should have taken the chances we had and then the 2 goals Al Ittihad scored wouldn’t have mattered. We didn’t though and so instead I need to look at why we conceded the goals we did, why we didn’t create more chances and what can I learn to avoid it happening again. How did both teams line up? The Al-Ittihad formation is not quite as negative as the Al-Shabab monstrosity but is very much setup to play on the counter. The 3 key players for Al-Ittihad were Grassi, Madu and Al-Biladi. What went wrong in attack? The one stat that does jump out is that we only had 53% possession when normally we average between 60% and 70%. There is only one team that restricts us to that low amount of possession in the Gulf League and that is Boring Boring Al-Shabab. It tells me what i already knew, Al-Ittihad, despite being 1-0 down, had come to defend for their lives and hope they caught us on the break. 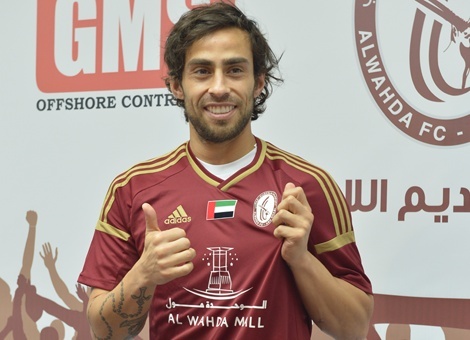 This is nothing new to me as most teams fear the Al Wahda war machine when it rolls into town. When we hit our stride we can annihilate teams, as we did to Hatta a week after this match when we put 10 past them. There are still those teams that are incredibly good at frustrating us and Al-Ittihad like Al-Shabab are one of those teams. Despite a reasonably standard looking formation it was clear very quickly that the opposition were playing defensive. The use of their wingers to tightly man mark my attacking wingbacks caused all sorts of issues as one of our usual main passing outlets was taken away from us. Granted i still think our fullbacks made it a little easy for them by not really making too much effort to break from their marker. It was clear that chances were going to be hard to come by as whenever we had the ball we were met by a wall of black and yellow. That wasn’t to say we didn’t create some chances, a few of which we should have really put away and the woodwork played a part too. Maybe not the easiest of chances but on any other day i’d have hoped at least one might have gone in but it wasn’t to be. Normally however I would have expected us to have had 3 or 4 that could have gone in which makes me think that maybe our general play wasn’t as good as it maybe should have been. Time to look at things in a bit more detail. Win or lose after every game I look at the individual player stats to see how everyone did and where players either excelled or didn’t meet my high expectations. It is even more important when we lose to see who didn’t meet expectations and then look to understand why and prevent that happening in the future. 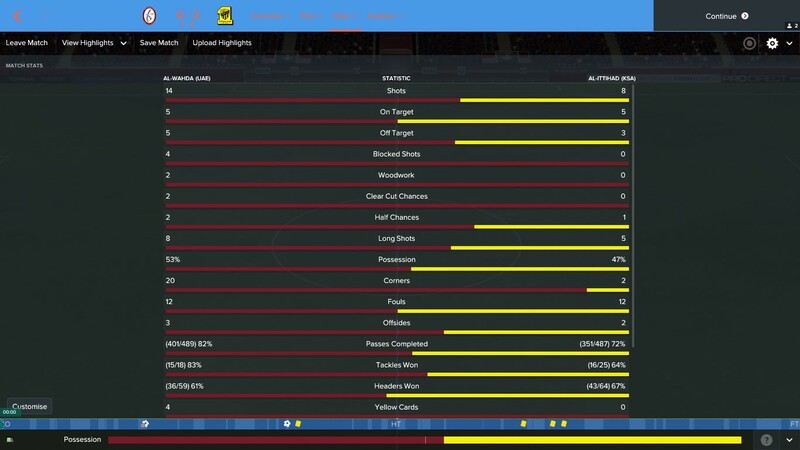 A big part of our game now is our passing and keeping the ball and the player stats above can tell me a lot about how well we were doing that. I tend to set a standard of 85% pass completion as an indicator as to how well things have gone to plan. Bearing that in mind my initial reaction is I’m pleased with how we kept the ball well in the middle of the park. How things should work in theory is that the ball is worked out from the back with Ghanem acting as a pivot and keep the ball moving out of own half without having to resort to punting forward. Once we’re over the half way line, Bawazir will take over and link up with Correa and Colidio in order to form openings for the two shadow strikers or wing backs to exploit. From the stats it appears this was working however the number of passes completed is maybe a bit lower than I would have expected. I will need to look at Ghanem and Bawazir’s pass maps to see exactly where those passes were going in order to establish whether them being restricted prevented us was creating more openings. Sticking with pass completion rates i can see that the shadow strikers, Omar Abdulrahman and Daniel Villalva, and wingbacks rates are well below the 85% threshold mark. Normally our shadow strikers and wingbacks link nicely in order to create space for the hugely talented Baek Jung-Soo to put dangerous crosses into the box. Al-Ittihad have obviously spotted this from the first leg and have targeted this interaction by getting their winger to man mark the wingbacks and hence stop the link between shadow striker and wingback. Without even looking at specific examples I know that without a clear passing option out wide the shadow striker, when in possession, would be forced either to try a risky pass or instead look inside and be met with the 7 man wall in front of him. Another area to look at in detail. My final observation on our passing completion rates is my two centre backs who are also below the 85% threshold. This on first viewing indicates either poor decision making from them or that the opposition has pressed them when in possession, forcing them to go long rather than use Ghanem. Final area to look at. I was slightly concerned that although Ghanem and Bawazir had made a lot of passes that many of them would have been back rather than forward because of how Al Ittihad were setup. Looking at the above graphic it does seem that the majority of them went forward and that both were looking to stretch the opposition by moving the ball out wide. No drastic changes required here I think. On first glance I’m slightly concerned by Marzooq’s two passes that have gone long as he shouldn’t be passing that long in his own half unless he was under pressure. Baek has also had a long pass intercepted from inside his own half and it clear that the two Al-Ittihad wingers were very much setup to make my two wingback’s life uncomfortable. Something to bear in mind should we play them again. Having seen on the team passing map the low number of passes that were actually made into the Al-Ittihad box I was interested as to why both Villalva and Abdulrahman struggled to penetrate the Al-Ittihad defence. 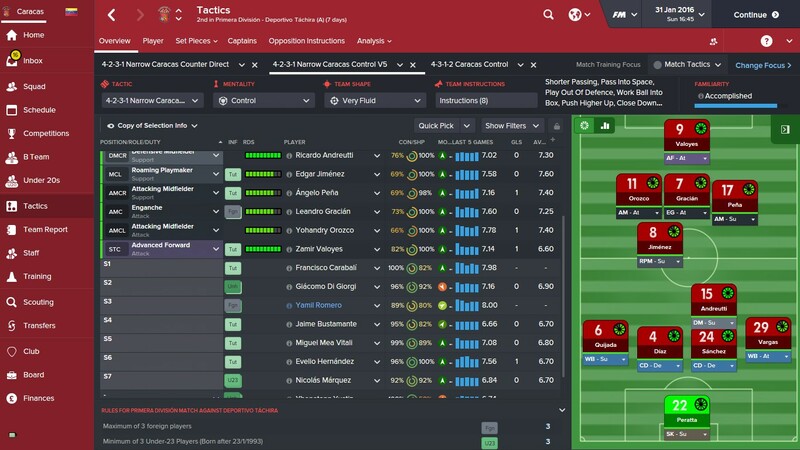 In most games that we dominate, both my shadow strikers link up with the wingbacks to get balls into the box for Colidio, Correa and the opposite shadow striker to attack. Below you can see some of the scenarios faced that prevented them from getting the ball into the box. Omar breaks forward but Al-Ittihad’s man marking limits his options and ultimately we lose possession. Having re-watched the match several times it’s clear that Al-Ittihad’s plan was not to allow us to stretch the play and instead turn our width against us by packing the channels with defenders and as such cut off our shadow striker’s passing options. It was a very clever tactic that would explain our lack of real chances. We’d need to do something different in the future to narrow the channels and bring our players closer together to hopefully create more passing options. Definitely food for thought. We like to play out from the back to help us dominate the game and as such I need my centre backs to get the ball to the right players. When looking again at the passing map our two centre backs had 21 passes intercepted. When looking at each one the majority were from defensive headers after a goal kick or long clearance by the Al-Ittihad defence. There were however a few passes made by Al-Meqbali that stood out. We’re just surrendering possession with stupid passes like that and one takeaway could actually be to use one of my less physical but more technical centre backs (Khalifa) for games like this. Al-Kamali on the other hand was excellent throughout and as i’ll now cover in our defensive play continues to be one of our most important players. One area that we weren’t at our best was at pressing players in the middle of the park and some of that may have been down to me setting our defensive line one notch off the highest. The idea behind that at the start of the game was to avoid the ball over the top whilst still pressing. In practice it didn’t quite work like that and the Al-Ittihad midfield had far too much time on the ball. Again more food for thought about what defensive line we should be playing against Al-Ittihad. They are the sort of team that can create something out of nothing so if we are giving them something to work in then we are only going to create problems for ourselves. I think for the most part we defended reasonably well and the more I watched the more I appreciated that their lack of threatening shots on goal were down to our good defensive work. On another day we’d have kept a clean sheet, the game would have finished 0-0 and we’d have gone through 1-0 on aggregate. Initially this was a result that drove me mad with frustration and anger but after having a few weeks of re-watching and analysing the match itself I now think I understand where we got it wrong. We were sluggish out of the blocks and our tempo was too slow meaning we didn’t match Al-Ittihad for intensity. We were playing too wide and Al-Ittihad exploited that defensively by plugging the channels and preventing us from getting the ball into the box. A more balanced width and higher tempo would probably be more suitable to bring our players closer together and allow shorter, quicker passes to not allow the opposition time setup their defence and hopefully find ways through. We definitely have the technical players to operate in close quarters so it is something I will be considering. Our defensive line needed to be higher as we didn’t press enough for both the goals and also gave Al-Ittihad’s central midfielders far too much room. Appreciate that Al-Ittihad are a bunch of bastards and not to underestimate them. There is a reason why they won the Saudi Arabian League, Champions League and almost won the Club World Championships a few years ago! I don’t think anything is needed drastically for our overall tactical approach as for the most part the way we play is very effective and that is why we are the best team in Asia. However we can always be better and the Al-Ittihad showed me chinks in our armour that needed to be mended. I’ve found the process of going through the game with a fine tooth comb really interesting as it’s given me plenty of insight into where we can be exploited and ideas for what we can do to turn things in our favour when things aren’t going to plan. It is a very useful exercise that I would recommend to anyone either struggling with results or just looking to improve. The time and effort is definitely worth it. As much as I’d love to promise to write a post on those 2 games to show you how changing/not changing things made a difference I think it is highly unlikely I’ll have the time given fatherhood is rapidly approaching. My plan instead will be to post the pkms on my slack channel #diegomendozatv and then have it as an open discussion to analyse what worked, what didn’t and where we still have work to do should we face them again. As many of you will have noticed time has been in short supply over the last few months and I’ve not been able to really write much at all. That doesn’t mean my love for FM has waned at all and I’m very much excited to get cracking with the full game once it’s released next Friday. It is no secret if you follow me on twitter as to who I’m going to manage this year but for those of you who don’t pay attention I’ll be managing Al Wahda (UAE) and the UAE National team. Not a South American team you say? Grab the pitch forks! Well after Caracas and Venezuela last version and Deportivo Cali/Defensor Sporting the version before I feel like it’s time for a slight change of scenery. Fear not the South American influence will not be disappearing and my plans for my time in Abu Dhabi will have a definite South American flavour to it. So why the UAE and why Al Wahda? In recent years the oil rich clubs of the Middle East have started to attract more and more high profile players and managers. When looking at some of the squad lists of the Saudi Arabian, Qatari and Emirates clubs the names of Xavi, Vucinic, Boussoufa, Lima, Asamoah Gyan (I know, I know but his scoring record in Gulf League is unreal), Seydou Keita, Carlos Eduardo etc. all jump out. Furthermore nearly all of the managers in the big 3 leagues are European or South American and it seems to be a region where football is definitely on the up. I’m not sure which is my favourite but both have been a key part of one of my sides at some point on FM over the years. So to have both of them in the same team was a no brainer when it came to picking a Middle Eastern club to manage. 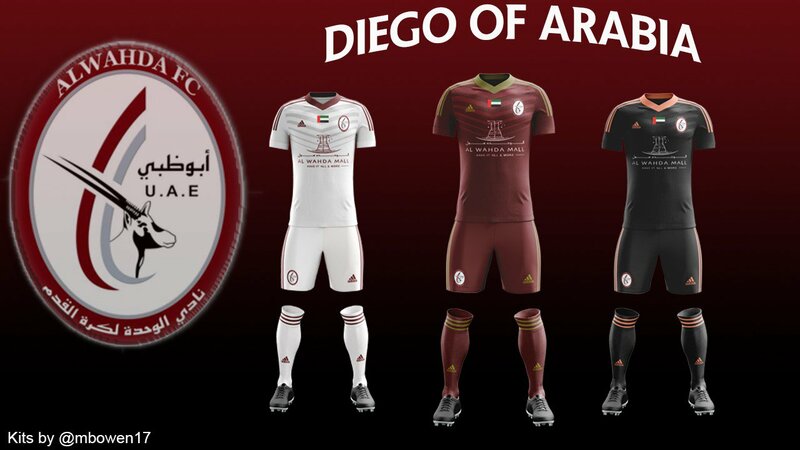 Also a clubs kit is always a big influence on my choice and by playing in a maroon Adidas kit without those bloody side stripes made Al Wahda the perfect choice for me. I also like a Club & Country save and despite my vocal frustrations of the lack of attention International Football has had from SI over the last few years I have decided that it is still an area that I enjoy and as such will be managing the UAE national side as well. Messi? No way Lionel could pull off that barnet so i’ll be referring to him as my Arabian Valderrama. Anyway he’s not the only talent in the squad as there is also the 2015 Asian Footballer of the Year on hand to finish the chances Omar creates. So two very exciting talents to build a nation around and with both players still playing their football in the UAE something to build the league around as well. Rather than start with what I want to win (everything), I’ll start with the development approach I’m going to try and implement. I said there would be a South American flavour to the save and my intention is to have South Americans involved in every element of the club alongside young, up and coming UAE players and staff. I’m allowed 3 foreign players (plus one Asian foreign player) in the first team and as such I will have at least 2 that are South American. I’ll also look to bring in a few veteran South Americans to play with the reserves, tutor some of my youngsters and the long term plan will be to have them join the backroom staff once they retire. Ideally i’d also like to establish a feeder club in South America to be able to send young UAE players across to learn the South American way. What I’m hoping then is that some of the South American influence starts to wear off on the UAE youngsters coming through and that we ultimately become the Chile of the Middle East. An Arabian Hugo Ojeda would be nice too, I can but dream. Trophy wise the goal initially has to be for Al Wahda to win the Arabian Gulf League which is by no means and easy task given the teams around us. Al Ain and Al Ahli are very strong and Abu Dhabi rivals Al Jazira have some great players and will be tough opposition. If you then throw former Champions Al Wasl, Al Nasr, Al Shabab and Al Sharjah into the mix you have got the makings of a very competitive league. 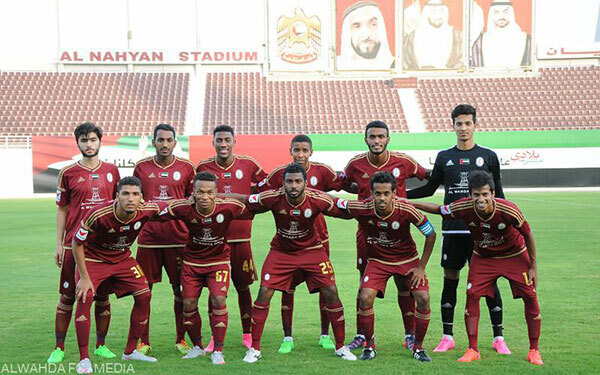 If you are interested you can read a real life preview to this season’s Gulf League on the excellent Ahdaaf website. Perform in the league and then we’ve got the next challenge of the Asian Champions League. I thought the Copa Libertadores was competitive but given some of the money flying around Asia over the last few years the ACL could well be just as competitive if not more. Al Ain is the only UAE club to have ever won the competition and with the players now playing for the Chinese sides it is going to be difficult to overcome them as well as the usual challengers from Saudi Arabia, Qatar, Japan, Iran and South Korea. On an international stage the first priority has to be to try and qualify for the 2018 World Cup whilst looking ahead to 2019 Asian Cup that’ll be hosted in the UAE. Realistically the 2022 World Cup has to be the competition we look to really try and put our mark on the world stage. I love writing blog posts but the reality of my life these days is that I don’t have the time to consistently produce blog content so as such I’m not going to make any false promises about regular blog content. If I find the time to write about an element of my save in a bit more depth than I will but i can’t realistically commit to regular season updates. I am however going to be keeping a constant update of my game on twitter. I’ve really enjoyed sharing my day to day thoughts on Caracas and the resulting interaction with everyone that follows my save. I will continue to share my thoughts on my save, tactical conundrums that I consider whilst walking the dog, screenshots of players, stats, moments and any other interesting/funny parts of my save to keep everyone in the know. Also as most of you know I’m an emotional manager who will always be vocal about the highs and lows of Football Manager. So expect rants about players not being able to finish chances, opposition scoring their 1st shot on target, frustrating 0-0’s and also excitable tweets about last minute winners, wonder goals, and all round beautiful footballing moments. Live tweeting of big games or when Mrs Mendoza is at yoga will also definitely continue. Good or bad, I plan for my ride on the Al Wahda and UAE roller coaster of emotion to be as enjoyable as Caracas and Venezuela was last year. I’ve got a few weeks before I can start the save as I need the editor and a few of the league updates from Claessan before I can get started but as soon as they are all in and ready to go then you’ll know about it first on twitter. P.S. Thanks for the opening image Marc Bowen, great stuff. So I’ve been pretty rubbish at posting over the last few months as real life commitments have meant a lot of my time previous reserved for writing no long exists. That said with all the great stuff coming out at the moment it feels right to join the party again and get something down on paper/wordpress. For those of you that follow me on twitter you’ll know that it’s been an eventful time in Venezuela recently. It’s almost run away with me so much it’d have taken a small novel to bring you up to speed with whats happened. 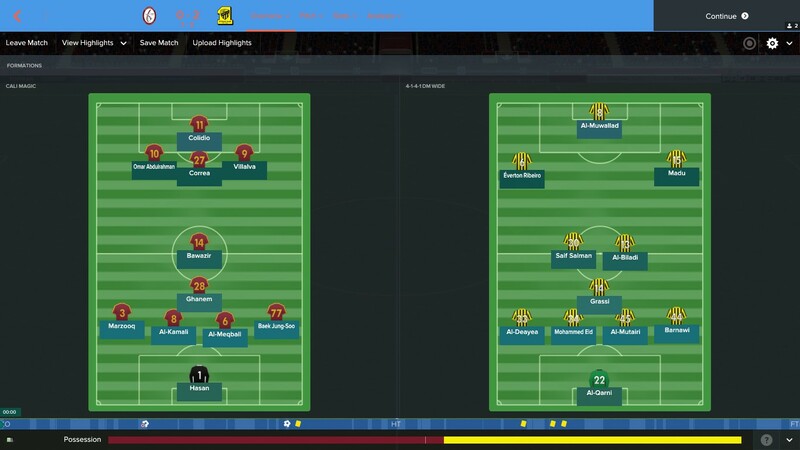 So rather than go back through the past 4 years I thought over a series of posts I’d just give you a snap shot of where we are at now, a personal insight into the Caracas squad, a more detailed look at how we play and what I still want to achieve before FM17. A lot has happened since I last updated the blog and the past 4 years have been a bit of a whirlwind. We have become the dominant force in Venezuela, winning everything domestically since I took charge of Caracas. On the continent we went through a few rough years before getting our act together and surprising everyone to win the 2018 Copa Sudamericana. For those of you that aren’t familiar with the competition, it is the South American equivalent of the Europa League and was famously won by Jorge Sampaoli’s (my FM idol) U de Chile side in 2011. It was great to emulate that side as I’m trying to follow the Sampaoli model in developing Venezuela as a whole into a decent footballing country. 2019 saw us grow more as a team, helped by the fact i’d managed to retain a number of our key players (more to come on them later), and we managed to follow up on our Sudamericana success with a superb run to the Copa Libertadores Final. We were however well beaten over the two legs by Boca Juniors who had also made light work of us in the Recopa as well. 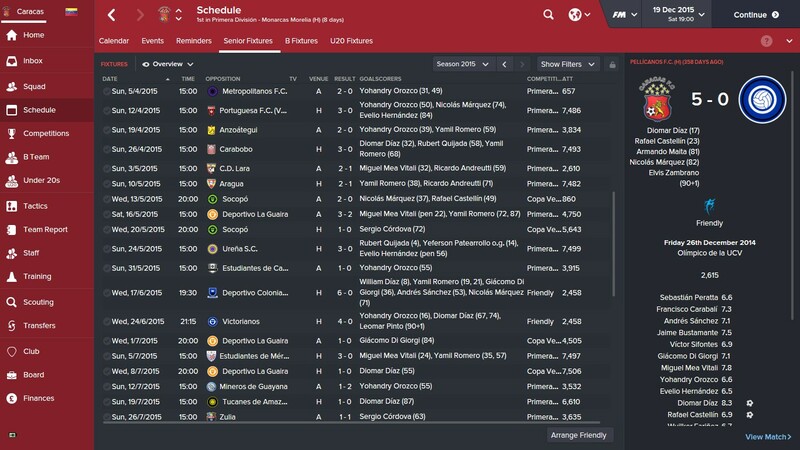 Our attempts to retain our Sudamericana crown were also thwarted by Independiente in the Semi Final. I was gutted by both results but at the same time encouraged at the progress we were making. The national side also started to see an improvement in results and despite not being able to win away from home we went into the 2019 Copa America full of hope that we might cause a few upsets. Despite an awful opening loss to Chile we upped our game, drawing with Colombia and then dramatically beating Argentina to reach the quarter finals. Japan B were easily dispatched to setup a meeting with Uruguay. Despite a decent performance we missed too many chances and were punished unsurprisingly by Luis Suarez. Peru having surprisingly beaten host Brazil in the other semi final went onto lift the trophy whilst Brazil and Neymar carved an exhausted Venezuelan defence apart in the 3rd place playoff and a 4-1 loss saw us finish 4th. Not a bad result though prior to the start of the World Cup qualifiers. 2020 brought new hope as having gone close in a number of competitions in 2019 I felt that with a few additions we really could go all the way this time. 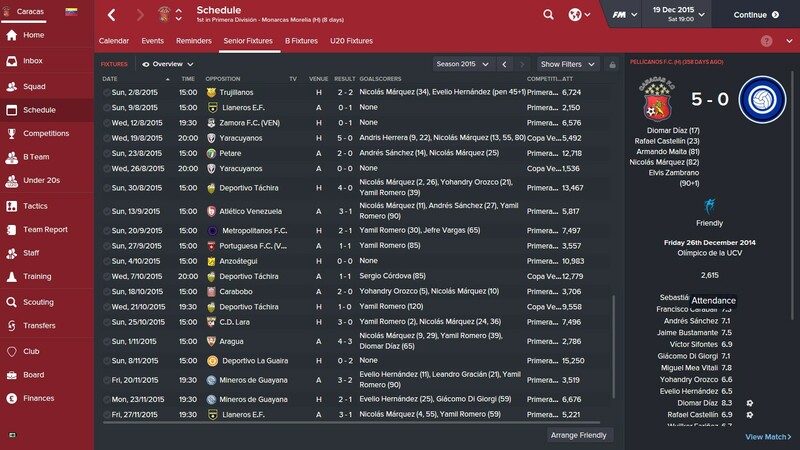 We dominated our group in the Libertadores beating Barcelona, Nacional and Cruz Azul to top our group. This setup a second round match with Olimpia of Paraguay. They were comfortably dispatched to setup a quarter final match with Velez Sarsfield, a team that now contained former Caracas superstar Maxi Romero. What happened on that Wednesday night in Buenos Aires was truly breath taking. 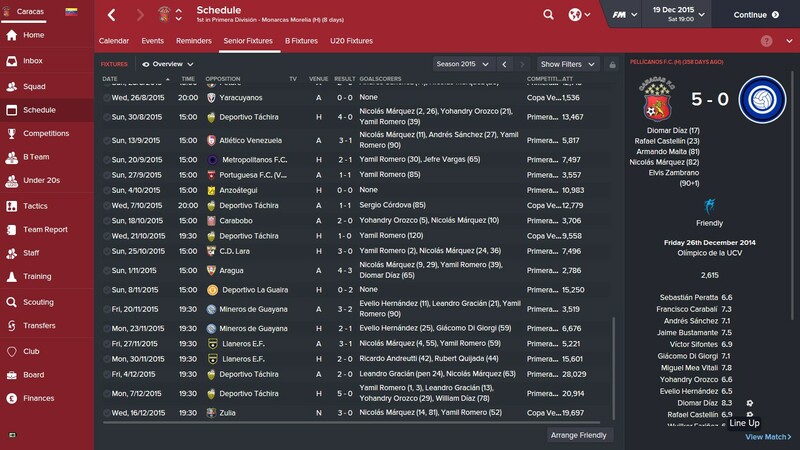 We put 8 goals past Velez in what was at the time one of my greatest nights on FM. 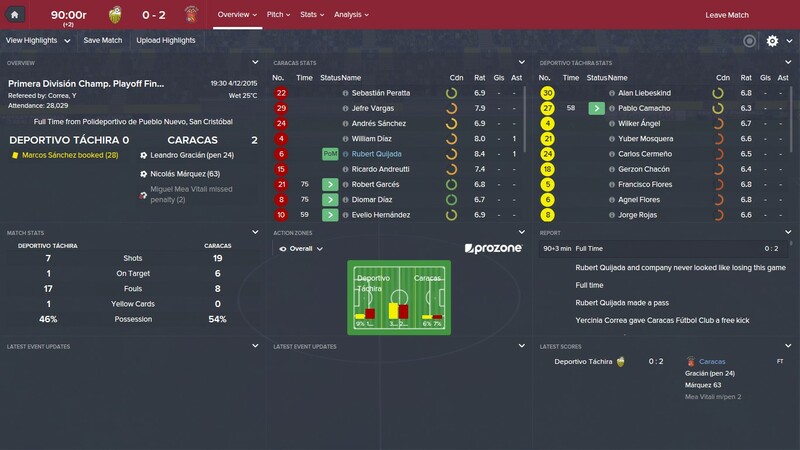 Despite this healthy lead the home leg in Caracas was a bit of a disappointment as we drew 0-0. Still we progressed to the Semi-finals with Queretaro standing between us and a second attempt at the Libertadores crown. The Mexicans put up more of a fight than Velez and we fought hard for our 2-0 win in Mexico. Again we lacked a bit of quality in front of goal in the home leg, drawing 1-1. Still it was enough to get us to the final . Our reward? A consecutive final against now arch rivals Boca Juniors. Unlike 2019 we’d travel to Argentina for the first leg, which given Caracas to Buenos Aires is a 3,800km round trip is no easy first leg. Even so we’d give it our best shot and if we could keep it tight in La Bombanera then there was a chance we could win it in Caracas. Now it is a rarity that I can treat myself to a proper cup final night these days but I was home alone so made the most of it. The laptop was hooked up to the TV, full match highlights selected and a cold stella/nut platter were on standby. The highlights of the first leg can be seen here, good goals too. So a very quick update to get you started of where I’m at with Caracas and Venezuela. Progress is definitely being made and at least now I feel like I can post again without there being a massive section missing. Fear not I will be looking at both the Velez and Boca games in more detail in due course to put some context behind the wins and show they weren’t necessarily a fluke. Mendoza Magic V8 deserves its own post. It’s not all about tactics but also about the players that interpret my words of wisdom and with that in mind I’d also like to talk a bit more about the squad that made it happen. I’ll also share what I have planned for them and some of the young guns looking to break into the team. This is already in progress so you can expect something within a week or so. I also have the small matter of a World Cup to qualify for with Venezuela…8 games to go and we’re very much in with a shout. For now though keep an eye on twitter for up-to-date goings on and hopefully a few more posts to come in the near future. So it’s been a good number of weeks(over a month) since my last update as work and Christmas have meant both FM time and the time to write about it have been in short supply. As i write now I have almost finished my 3rd Season with Caracas and Venezuela and as some of you may have read it’s been a bit bumpy. Now for those that follow my posts on twitter it’s been a frustrating start to 2016 on FM and a number of problems had started to develop that I struggled to correct. I want to look at that part in a bit more detail in a separate post but first off I want to provide you with a review of Season 2. Having won the double in my first season in charge expectations were high and if I’m honest it felt like we’d grown as a team and that everyone was now bought into the Mendoza way. We had the added challenge this year of competing in the Copa Libertadores and Copa Sudamericana(this is sadly broken on my game so won’t be posting about it) was going to bring it’s own challenges as we would have to better utilise our squad to cope with the busy schedule the competitions would bring. I think for the most part we coped very well with both the fans and my expectations and dominated the league in the first 6 months with no one really able to touch us. New signings Pena, Valoyes and Jimenez were superb, the latter finding an excellent understanding with Andreutti in the engine room, which really propelled the team forward. Orozco continued his fine form from last season and his dribbling terrorised defences both at home and on the continent. I was also pleased to see the emergence of Jefre Vargas at right back and both him and Quijada performed well enough to warrant a call up to the national side. Leo Gioda and Leo Gracian both overcame their injury problems and established themselves as key cogs in the Caracas machine. 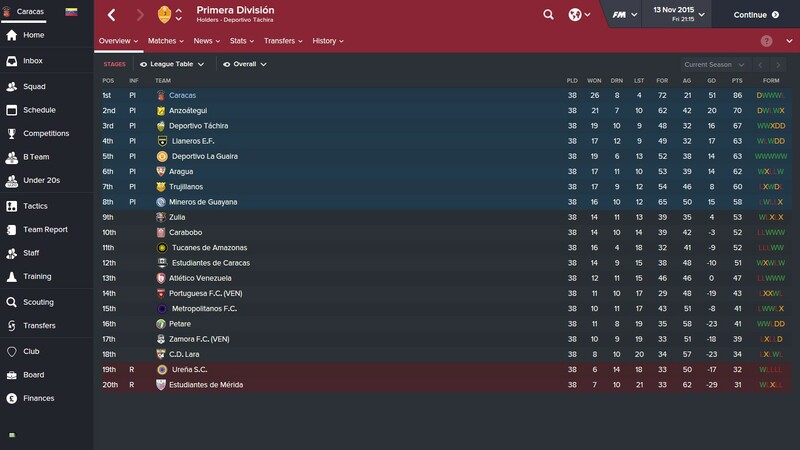 The good form in the league also flowed over to the Copa Libertadores, and in a group that contained River Plate, River Plate (URU) and Union Espanola, we managed to finish second in the group. 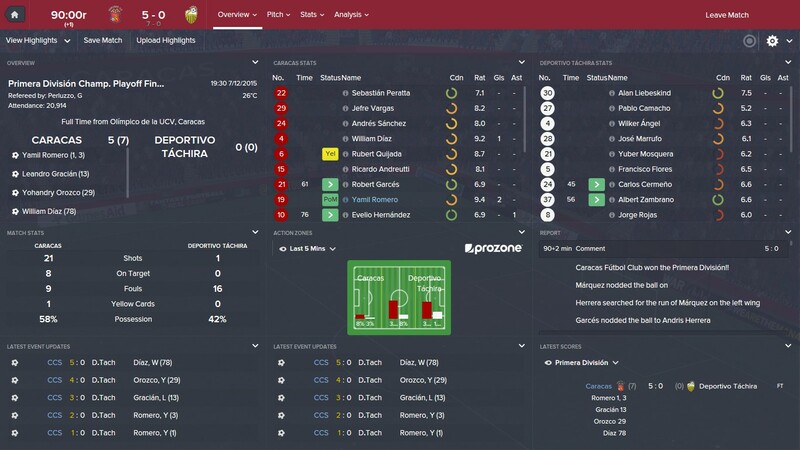 The highlight came at home to River Plate where we dominated from start to finish and ran out 3-0 winners. I can’t not mention the away leg either where we managed to hold them to a 0-0 draw despite not having any of our international players. 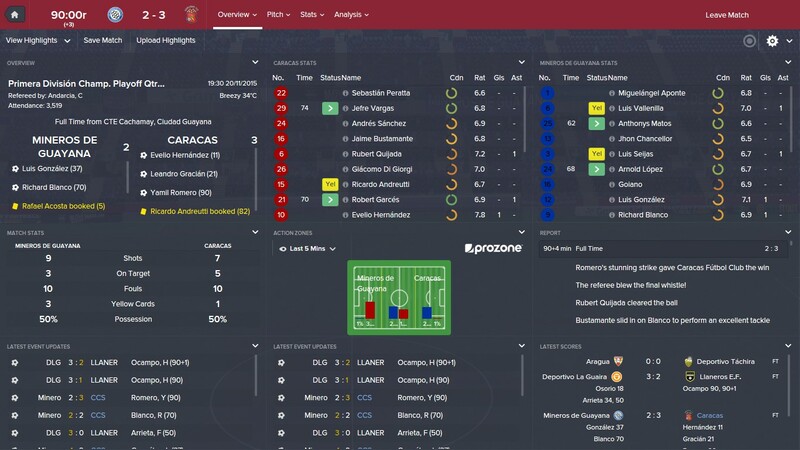 Monterrey 5-0 Caracas…4 goals from deep crosses and a penalty and our Libertadores dreams were in pieces. I mean we’d done well to get that far but I couldn’t help but feel a bit annoyed about the whole thing. We’d not had any problems with deep crosses the whole time i’d been in charge but then after a 5-4 win over Mineros with similar problems I realised that something had obviously changed after that patch that required a tweaking of my tactics. It would then seem that it wasn’t just deep crosses that had suddenly become a problem but also finishing seemed to rapidly get worse, especially against the poor teams in the league. Now some of this could be down to the tweaks that were made to the match engine which improved defending but also the boost in reputation following my Libertadores performance will have meant the majority of side in Venezuela will have been even less inclined to take risks against my side. Either way we had a problem and I had to fix it. I implemented tweaks to the roles and instructions here and there as I looked to find the kind of form we showed pre-Monterrey. We continued to get results but more so in part to a decent set piece routine and the odd moment of brilliance from Orozco or Pena. I knew though that eventually it would catch up with us. 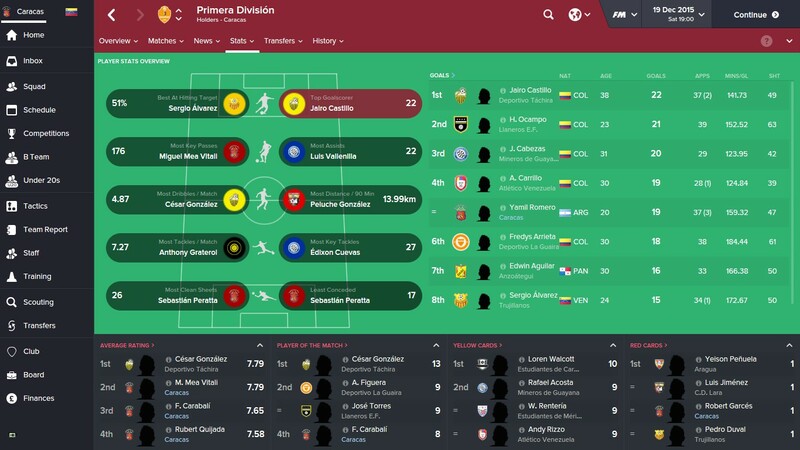 The Semi Final brought us up against arch rivals Mineros de Guayana in what always promised to be a feisty affair with plenty of goals and controversy. 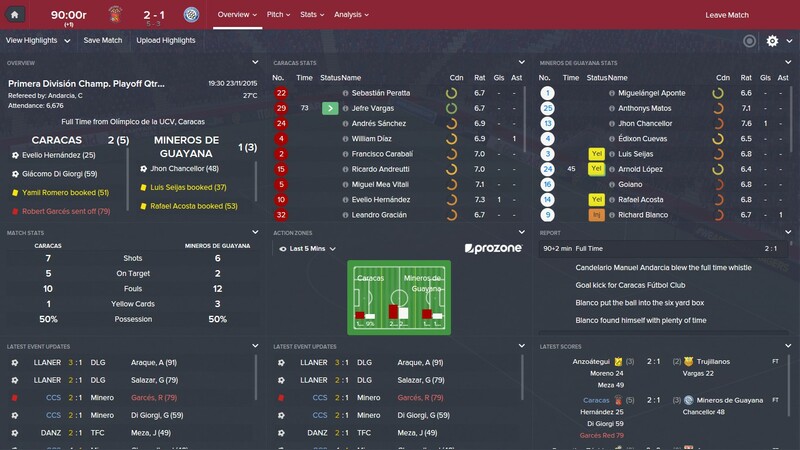 The first leg in Guayana saw us go in at half time 2-0 up and cruising. Maybe we’d overcome our struggles against them? Unfortunately we switched off both at the back and up front and made things a lot tighter for the 2nd leg than I would have hoped. No away goals rule in Venezuela so it went the bloody distance didn’t it? I was fuming. Time and time again we failed to finish our chances only for Mineros to score from their first attack of the game in the 68th minute. Just when it looked like it was going to penalties substitute Zamir Valoyes dribbled past 3 defenders and finished from the edge of the area to send us through. Despite the moment of magic I refused to celebrate. I was not a very happy Mendoza and there were some very strong words in the dressing room after that game. I expect a lot of my teams and they had let me down and could have undone a season of hard work had it not been for a moment of brilliance. …yep you guess it our finishing was terrible once more. I thought that the penalty might give us the luck we needed to push on but again a team managed to score from their first attack against us. I couldn’t even speak to the team after the match I was so angry. Valoyes, despite his semi final heroics, was far too inconsistent and had pissed me off for the last time. He was placed on the transfer list instantly. Yamil Romero who’d been excellent in our first season had seemingly started to believe a bit too much of his own hype and had become a consistent disappointment. He would be returning to Boca Juniors at the end of his loan spell. …then in the 86th minute Zamora had their 2nd attack of the game and well you guessed it…bloody scored. We were now never going to get a 3rd in the last 5 mins so like the Mineros game we went to extra time. Though as if the game couldn’t have pissed me off enough, Jeff Vargas then got sent off in the 105 minute and Andreutti went off injured in 112 minute. We were down to 9 men and staring at the unthinkable, a potential Final defeat. Zamora sensing that we were wounded badly decided to actually play some football and had 3 shots in the last 8 minutes, more than they’d had in 200 minutes of football previously. 18 year old goalkeeper Wuilker Farinez the hero as he saved 3 of Zamora’s penalties. We’d won and the save was saved…by the bloody gloves of my prodigy goalkeeper. I shouldn’t have to rely on the youngest player in the squad to save the bacon of my under performing “experienced” players. 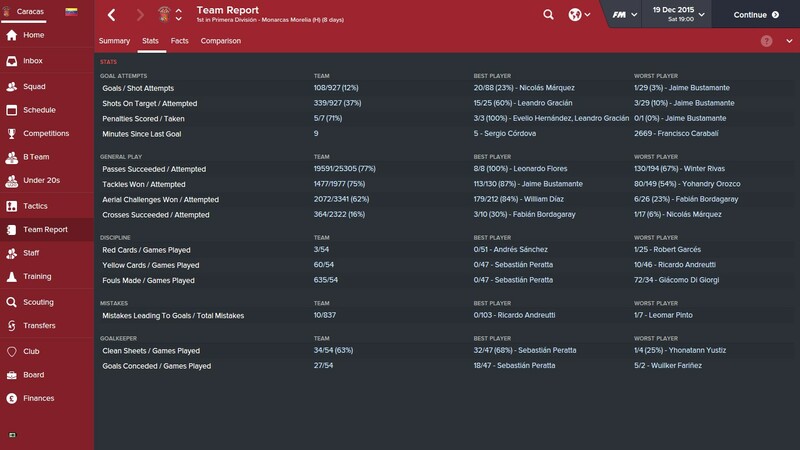 I needed a few days off before the cup final to avoid transfer listing half the squad and let my blood pressure come back down to a normal level. So Cup Final day arrived as we looked to secure our second domestic double in a row. 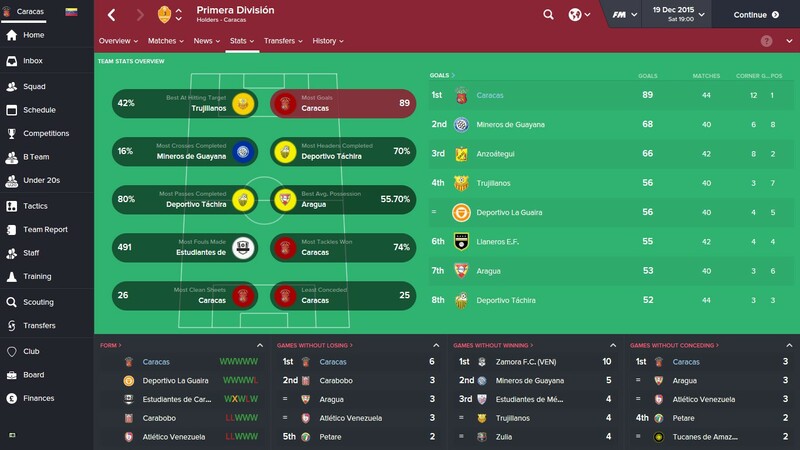 Now arch enemy Mineros de Guayana were our opponents and we lined up to clash once more. We continued to knock on Mineros door but couldn’t find a 3rd. We went in at half time 2-0 up and I naturally told the team to not get complacent and their performance levels drop. We picked up where we left off in the 2nd half but just couldn’t find that 3rd goal to seal it. Then Mineros had an attack…cross from deep…goal. 2-1. Balls. I composed myself and just said to myself keep doing what we’re doing as we’d dominated them for 75 minutes. Despite the score we looked comfortable and Mineros didn’t look like getting forward. The clock turn 90 and there would be 3 minutes of added time. Surely we’d hold on? Then a pass back to the goalkeeper went out for a corner…in the ball went and well you guessed it…Gioda put into his own net and and out of nowhere the game was going to extra time. All i’ll say is you didn’t want to be a Caracas player in the dressing room at that point. I sent the lads out in the knowledge that if they didn’t come back with the cup they’d be finding employment elsewhere next season. We huffed and we puffed but the little Mineros piggies sat tight in their brick house, Miguel Aponte stopping everything we threw at them. They even ventured out to take advantage of our tired legs but Baroja kept them out. Though just as it looked like it would be penalties again, academy graduate Eduardo Gonzalez, playing his last game for the club, beat Luis Parra down the right hand side and swung a deep cross into the box. Aponte and Chancellor for the first time in the match made a mistake, neither managing to intercept the cross. At the back post though was 18 year Daniel Saggiomo to poke home only his 2nd goal for the club and save the careers of some of his team mates. 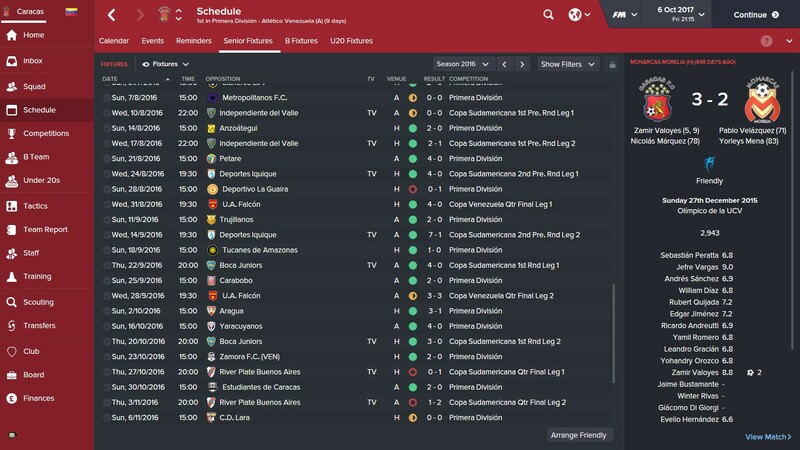 It wasn’t quite the end to the season I was hoping for after our great start and performance in the Libertadores. It very much felt like we’d taken a step back rather than forward despite me having seemingly strengthened the squad. Now I’ve touched upon our main issue and that has been both our finishing and sometimes lack of concentration that has let teams back into games. It is something that I was scratching my head over and eventually required me to bring in some outside help to suss out what I/the team was doing wrong. Who better than Cleon to listen to my tales of woe and cast his well trained eye over some of our matches? I’ll not go into too much detail what he said as I want to save that for a later post however the one thing Cleon pointed out straight away was that a lot of how the opposition plays against you is based upon reputation. The bigger the difference between the two the more defensive the opposition will be. When I take this into account we have over performed in the first season and a half which would have seen our reputation rise, especially after getting out of the group stage in the Libertadores. The trouble with this is that our quality of player and coach has maybe not yet risen as high as our reputation and thus we are trying to break down stubborn defensive walls that require a better hammer/breaker(if you don’t know what a breaker is then google Hilti Breakers and watch the promotional video…a proper man toy). Either that or we need to adjust approach somewhat to entice the opposition out of their defensive shell. Questions that will all be evaluated when I look at the problem in a bit more detail, share Cleon’s views on my performances and tactics and look at what both he suggested and I have implemented to take Caracas FC to the next level. There will also be a separate post on the national teams exploits in their attempt to qualify for the World Cup. That’s all for now and thanks again for reading and hopefully you won’t have to wait as long next time for an update. As I mentioned in my previous post, I want to be more reflective with my games this year and get down on paper (well blog page) what is in my head. Now if you follow some of my tweets you’ll know what has happened recently anyway but I thought it would be good to look back at the season as a whole. I want to share some of my thoughts of how I think we did, where we can improve and who really stood out for me over the course of the season. I want to finish off with a quick look at the season ahead, the new faces that have arrived and what I hope to achieve in my second season in charge of Caracas. Being the most successful club in Venezuelan football there is a general expectation that Caracas FC should be challenging for the title every year. I’m pleased to say that is exactly what we did all season. Now the way I’ve set the Venezuelan league up is not as it is in real life, I just have one long league campaign with the top 8 teams then playing each other in a Mexican style Liguilla to determine those teams that will play continental football and more importantly the overall champion. On first glance you could say that it was easy given that we finished 16 points clear of our nearest rival. Anyone though that has followed my, at times, rather frustrated tweets will know that it hasn’t been as easy as it looks. A lot of our performances have been below my expectations and at times we have really struggled to break down some of the stubborn defences you find in Venezuela. We have also looked a tad lethargic and our pressing has been no where near the level that I expect of my sides. There has been a lot of head scratching, analysing, tweaking, more scratching, more tweaking and normally ending up back where I started. 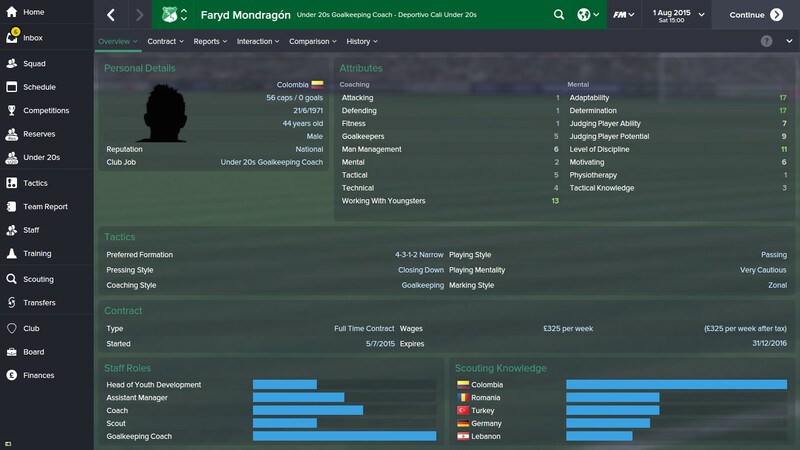 Now as I do with every version of Football Manager, I read as much as I can from around the community. 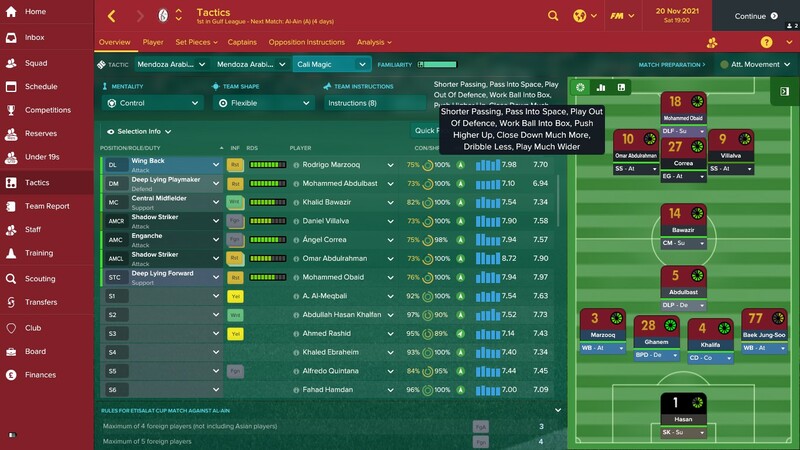 I find there is always a little tweak or idea that I hadn’t thought of that can be applied to my tactic. In this case it was after reading @Cleon’s article on possession and him giving his goalkeeper the instruction to the roll the ball out to his centre backs that i decided to reapply…simple I know but suddenly everything just clicked. 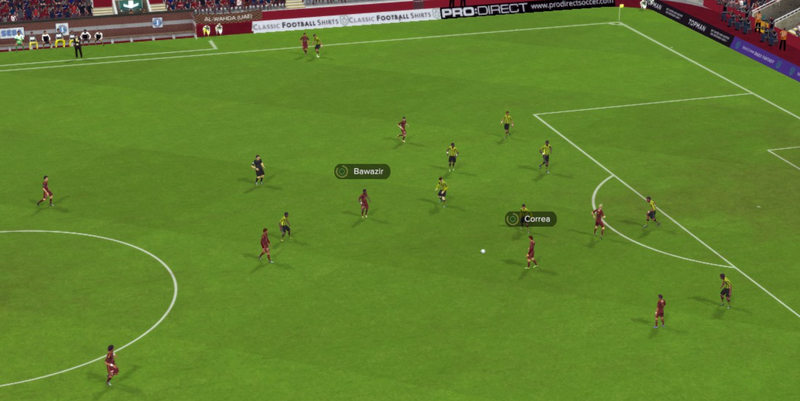 On reflection now it’s obvious, the centre back having the ball from the goalkeeper rather than the striker pulls all the opposition forward and opens up space for my attacking players to work in. Anyway I’ll not get too technical in this post but just want to illustrate that sometimes you are just one instruction away from that tactical sweet spot. We were drawn against Mineros de Guayana in the quarter final who’d surprisingly finished 8th but were a team i’d not actually beaten yet. They play annoyingly effective 4-3-3 with 3 very dangerous strikers and an exceptionally effective 41 year old right back assist machine. I know i’ve just talked about my tactical changes to the 4-2-3-1 narrow, but given the problems i had against Mineros in the past I decided to go with my strikerless triple pivot to hopefully negate the threat of the triple striker. Things started very nicely with us going into a 2-0 lead thanks to goals from Hernandez and Gracian. Mineros though got back in it before half time with that man Vallencilla providing the cross for Luis Gonzalez to tap home. Things got even worse when Seijas crossed from the left flank for Blanco to tap home. 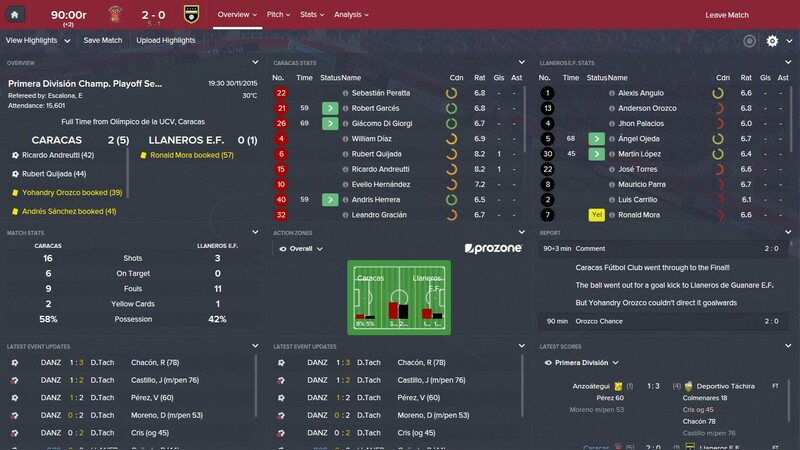 We’d thrown away a 2 goal lead and I was fuming but it is times like that where a player can make a name for himself. Yamil Romero did exactly that when in the 90th minute he hit a cracking effort from outside the box and give us the advantage going into the home leg. The home leg turned out to be a similarly tough affair but thanks to goals from Hernandez again and Giacomo Di Giorgi we fired out way into the semi final. The Semi Final saw us drawn against Llaneros FC, another team who we’d yet to beat this season so was going to be in no means and easy route to the final. 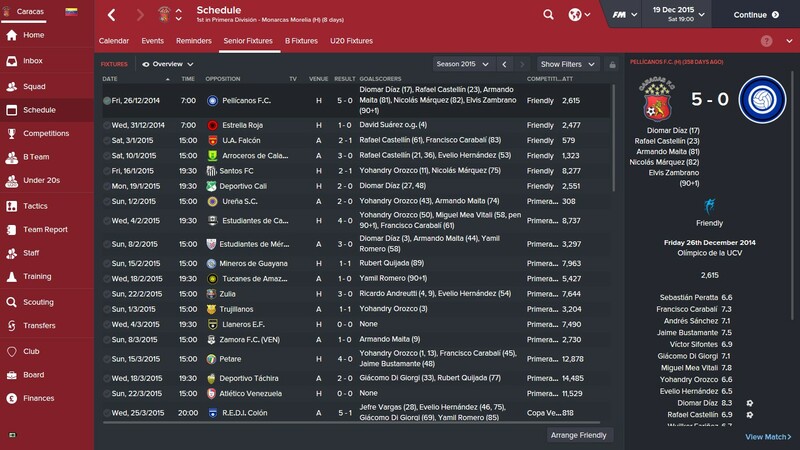 Thankfully though in the first leg we blew Llaneros away and the 3-1 scoreline could have been a lot bigger in our favour. It meant that just a solid performance at home and we’d be into the final. Solid indeed, a great performance from the lads and it would see us up against our biggest rival, Deportivo Tachira, in the final. Given our position in the league it meant we got to play the away leg first and I think I actually looked forward to playing Tachira more than Llaneros and Mineros given our record against them. Even so I’m not one for being complacent and Tachira had definitely up their game since our last meeting when i beat them 4-0. It looked like it’d be one of those games when Mea Vitali missed a penalty in the 2nd minute but thankfully the team rallied and we came away 2-0 winners thanks to another penalty from Leo Gracian and a tidy finish from up and coming star Nicolas Marquez. We were absolutely sublime, literally the best performance I’d seen since I’ve been Caracas manager. We were everywhere and absolutely obliterated Deportivo with them not even managing a shot on target and having to resort to fouls just to stop us. Below are two of the best goals we scored from the match, the pressing and general build up place is what I’ve been striving from my team all season. We’d done it, despite a stressful season the team had come good when it mattered and I was buzzing. A week later we also had the smaller matter of a cup to win too and we carried our good form from Championship Final to beat Zuila 3-0 and complete the double. It was exactly the boost I needed to press on with the challenge. 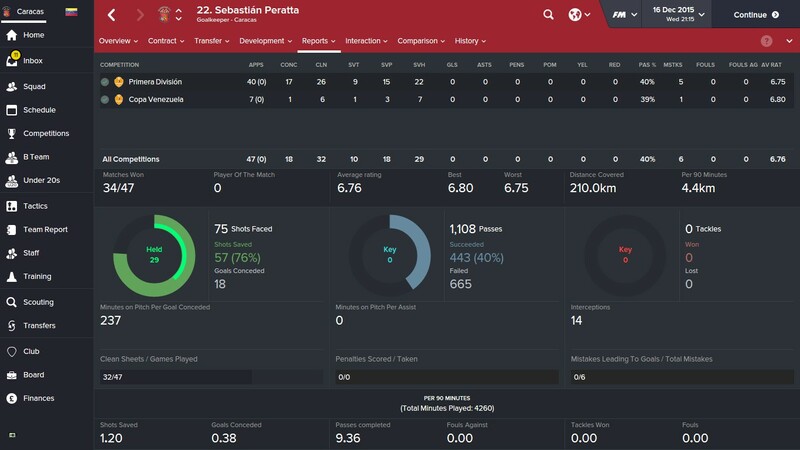 With Sebastian Peratta, Yamil Romero, Yhondry Ozorco, Leo Gracian and Jamie Bustamante being the five signings I made at the start of the season, the squad at my disposal was pretty much what I started with. It is by no means the finished article but there were some very promising performances. The stats confirm what I already knew about the need for our shooting to improve dramatically, the percentages are far too low. I think we can definitely get our passing and tackling accuracy up to the 80% mark next season. If we’re going to challenge the big guns in South America we have to be accurate in everything we do at all times so these will be good indicators to see the progression we are making next season. In terms of players I was impressed across the board but really the 5 that stood out were Miguel Mea Vitali, Ricardo Andreutti, Yohandry Orozco, Yamil Romero and Nicolas Márquez. Mea Vitali and Andreutti were superb in midfield and I will be taking a look at Andreutti’s role in future posts. Orozco and Romero were constant goal threats from midfield and both were capable of scoring important goals too which is invaluable to have those kind of players. With both of them being young they can only get better this season coming. Finally I’ve included Márquez because I had little or no expectations for him this season and really he only found himself in the side due to injury. He took his chance though and finished the season with 20 goals, scoring 1 every 120 minutes which is bloody impressive. Márquez was also 1 of 11 Caracas FC academy players to play for the team this season, Daniel Saggiomo, Elvis Zambrano, Andris Herrera. Winter Rivas, Roberto Garces, Leonardo Flores, Wuiker Farinez, Sergio Cordova, Leomar Pinto and Jefre Vargas all gained first team experience which is great for the future of the club. I have included the detailed stats of the main first team players below (sorry they are not in position order just order of screenshot). After a great season we’ve got even more to look forward to this year as we tackle challenges both at home and abroad as we will compete in both the Copa Libertadores and Copa Sudamericana. With this added commitment I’ve moved in pre-season to add a bit more experience to the squad. 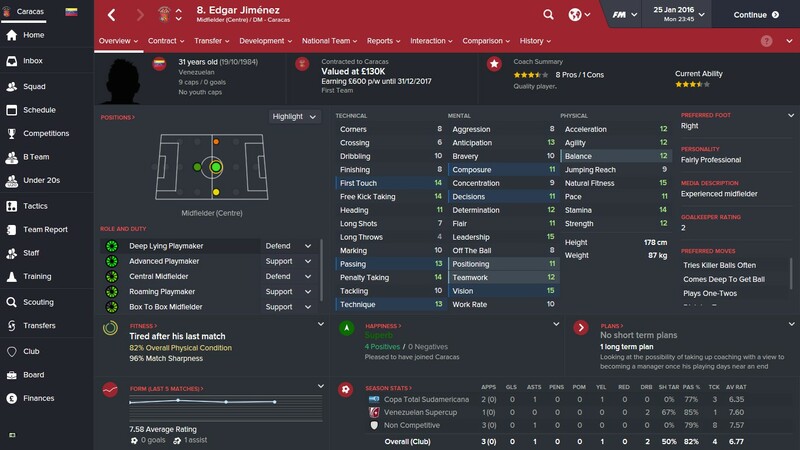 Edgar Jiménez returns to the club that he started his with from Carabobo. This will take some of the creative weight of Mea Vitali and in fact I suspect he’ll most likely start ahead of Mea Vitali. 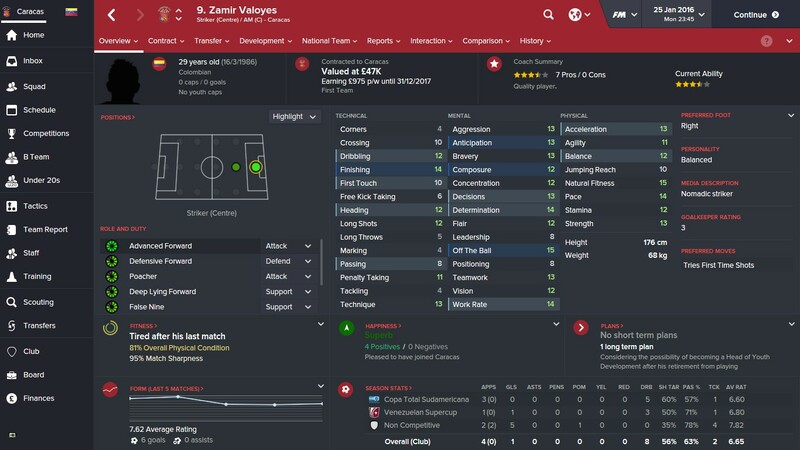 Zamir Valoyes returns to Caracas as well from Colombia to add a bit of experience to our front line. A natural goalscorer he was add both experience and be a useful tutor for the young guns coming through the Caracas academy. 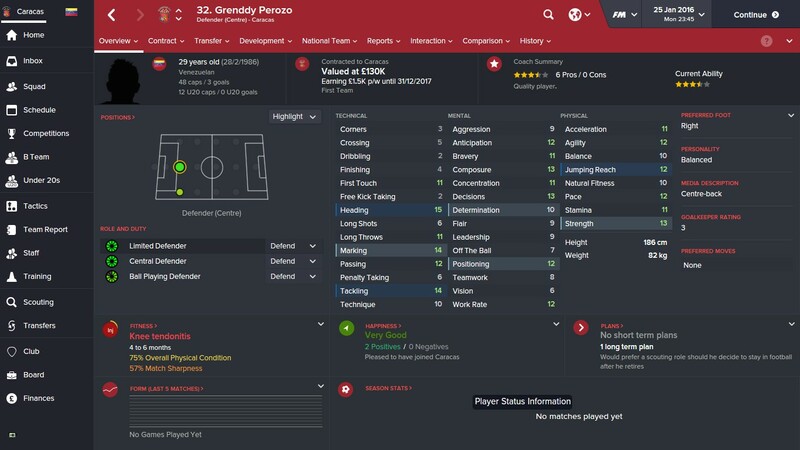 Grenddy Perozo was a great signing as i’d also been looking at him for the national side however he got knee tendonitis 2 days before the start of his contract so i’ll have to wait 7 months until he can play. 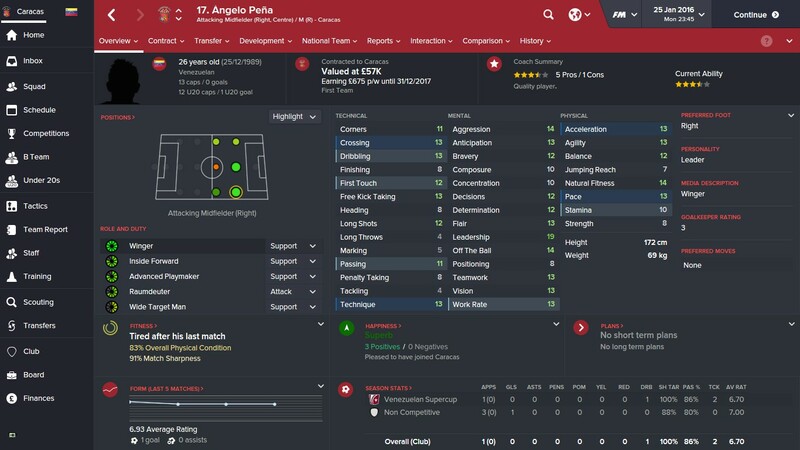 Angelo Pena again was signed for his mental toughness and leadership in the attacking midfield part of the side. He is also a former Caracas player and will be a useful player to have in tough matches. We also have as i mentioned in my opening post Edder Farias, Romulo Otero, Alain Baroja and Jhonder Cadiz to return from loan in June so our squad will be looking very strong by that point. Tactically I’m now settled on the below formation and tactic and this is now being used by all Caracas teams as i look to bring through the next generation with the Mendoza way flowing through their blood. Other than that it will be case of keeping doing the things we do right and improving the areas we could do we being a bit more accurate in. The one interesting bit of news for Venezuelan football in general was the tycoon takeover of Second division club Urena SC. Overnight they are now the richest club in Venezuela by miles, having over 22 million in the bank which is huge for Venezuela. Should make things very interesting and hopefully will only benefit Venezuelan football as a whole. I will follow in the next couple of weeks with a look at the next generation, an update from the National team and a more detailed analysis of some of the key Caracas and Venezuela players and their respective roles. For now though I hope you enjoyed reading my update and feel free to tweet me if you have any questions.